Father John held a special mass for our Year 6 pupils today. We looked forward to moving on, but also remembered the special times we have shared in the St Francis de Sales community. 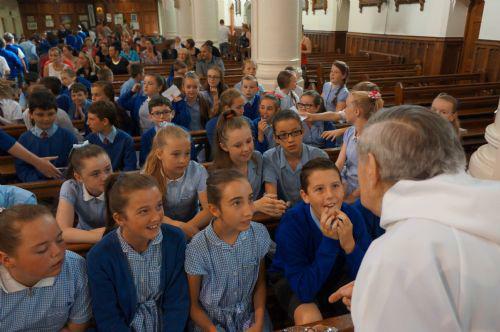 The children will all miss Father John - but they have promised him that they will, "Make God Happy".We were also very fortunate to enjoy two songs performed by our talented Year 3 teacher, Mr. Townley, who sang for Pope Francis in Rome recently when Archbishop McMahon received his Pallium. Many parents (and a few teachers!) were moved to tears by his beautiful rendition of Ecce Panis Angelorum.